I guess everybody knows the Ghostbusters. This game is based on the First Movie from 1984. 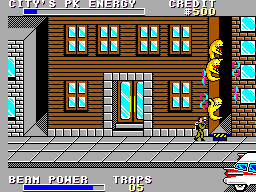 So you play the Ghostbusters and must go to Zuul to prevent Gorza from destroying the World. The Game is divided in 4 Parts. At first you buy your Stuff, you have a small amount of Money to buy a Car and all the Ghostbusting Stuff you need, from PK Detectors over Ghost Traps to the Ghost Vacuum. After leaving the Shop you see a map of New York, with your Ghostbuster HQ in the lower left corner and the Shop in the upper Right. In the Center is the famous Zuul. If you have the Super PK Detector, you should see some Houses flashing, that means there are Ghost. So drive with the Ghostbuster Logo to the House and press the Buttons. Now you are on the Streets, driving around with your Car, you must avoid the other Cars and the roadworks in the Street. Also there are Ghosts flying around, you should catch. After the Trip you arrive at the House and should see some Ghosts flying around, you have two Ghostbuster and a big Ghost Trap, now you should try to catch all the Ghosts, before they hit one of the Ghostbusters. The main thing you do in the Beginning is driving around and catching Ghosts. In the upper left corner of the Map Screen is the City PK Limit. It slowly raises until it becomes red, that is the Time the Marshmallow Man arrives, you should prevent him from destroying the Buildings. When the PK Limit is full red (and you have earned enough Money) you go to Zuul. Now you stand in Front of Zuul and see the Marshmallow Man in front of the Building jumping around. You have 3 Ghostbuster and must get 2 of them past the Marshmallow Man. You are now in Zuul and must climb the Stairs to the Top. The whole Building is infested with Roamers and other Ghosts, which try to slime you and they even throw plates after you. So hit them with your Ion Beam. You are now at the Top of Zuul and now get ready for the Final Fight with Gorza. This Fight is really hard, as you not only fight against Gorza but also against the two Dogs sitting on both Sides. But with a bit Luck you should have no Problem to send them back to Hell (or wherever they came from). The Graphic is nice. The Ghosts are well designed and the Big Marshmallow Man looks great. One thing I don't like about the Graphic is, that every Ghostbuster looks identical to the others and they are a bit to small. 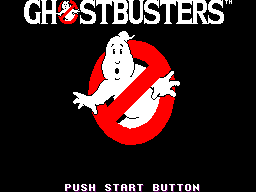 There is one Song and its of course the Original Ghostbusters Theme which is nice done (although it sounds much better in the C64 Version). Negative is, that the Theme is the only song in this Game, so you hear it all the time you play. The sound effects are OK, nothing special here, even the Ghost Trap make some funny noises. The Controls are good. I would recommend to play the game with the normal gamepad, as with the Control Stick it gets a bit difficult to get your Ghostbusters in the right position. After you beat the Game you get a Password. So the next time you play the Game you can use it and you get all the Money from the previous Game which makes the game easier as you can buy all the good things from the beginning. You can play this Game over and over again, as it is just fun to catch some nasty Ghosts. From all the Versions of this Game, the Master System Version is by far the best. Everything is fine made and the only Flaw is the Music (even the NES Version has a better Background Music). So I would say everybody should have the game as you get a good, extensive game, which gives you some Hours of Fun.